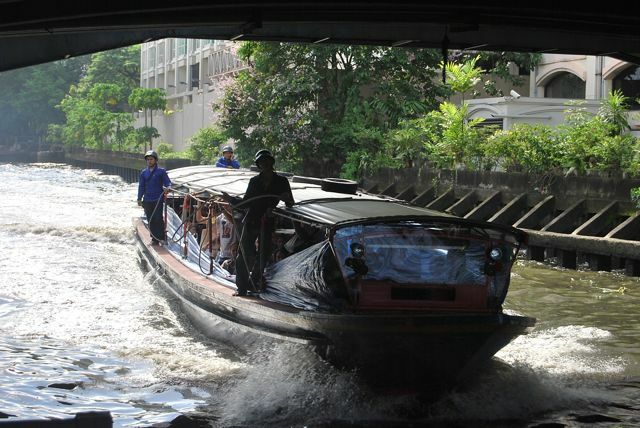 If you are visiting Bangkok you will need to travel around the confines of the city. It’s easier than you probably imagine for such a bustling city. This little guide may save you time, money and help you remain sublimely ‘sabai’ (relaxed, happy, comfortable) while you travel, sightsee or commute! 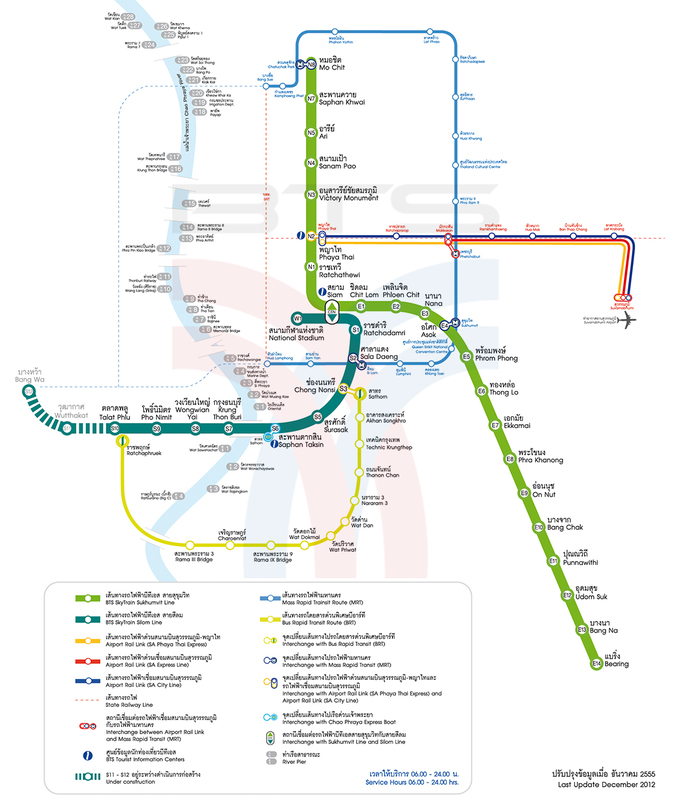 The click-able map below shows The Airport Link, which is part of the Bangkok Transport System anyway but usually referred to as a distinct entity from the BTS (Sky-train) and the MRT (Metropolitan Rail Transit) or the underground train and the way it can link you to various parts/districts of the city. Suvarnabhumi Airport, pronounced A.I.R.P.O.R.T (sorry!) Soovan-a-boom is to the east of the city and you will see that the line is made up of 3 lines; one yellow, one red and one blue. Check out the map as there are two express lines and one city (regular, slower) line.The express runs about every 15 minutes or so and the city line every 5 minutes or therabouts. Anyway, you will be on Thai time by now and taking life a little slower if you take my advice. Most folks are advised to catch the airport link to Makkasan where the light blue line intersects and you can transfer to the MRT from there or get a cab to your hotel as Makkasan is close to the area of lower Sukhumvit road where most travelers choose to stay. From there you can easily transfer to the BTS (Skytrain) and go north or south. The stations of Nana and Asoke will usually get travelers to their hotels and you won’t need to haggle and argue with a taxi-driver at Makkasan but will be in the Sukhumvit area proper and can either walk or catch a taxi to your hotel. It’s easy to buy tickets for all of these trains. 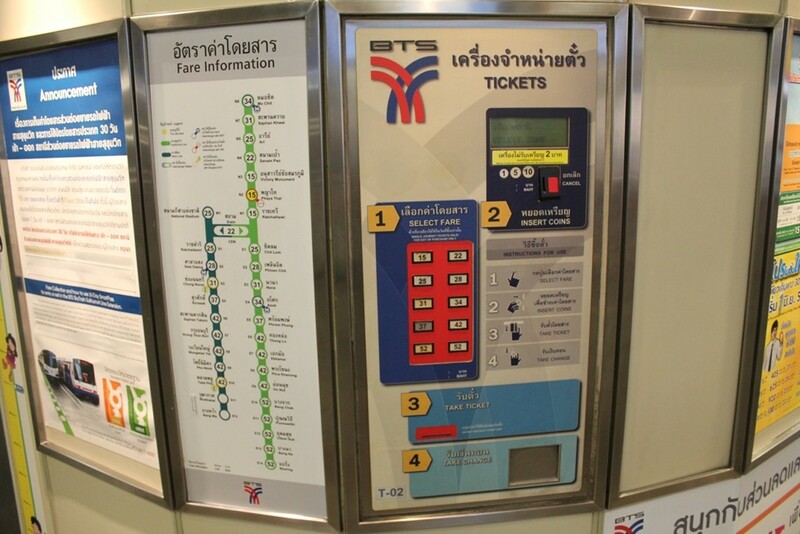 Just identify your destination from the line map on the left, find the corresponding amount in baht on the right, (1) on the easy to read instructions , press the button and put the coins in the slot (2). A ticket pops out (3) and you put that in the tollbooth slot. Easy. 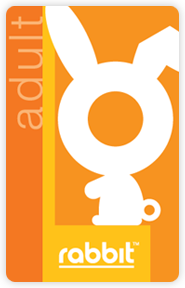 It is possible and very convenient to purchase a ‘Rabbit card’. Instead of paying 40 or so baht per journey each journey costs about 20 baht. The card lasts a month and you can purchase 15 journeys for about 375 baht up to 50 journeys I think for about 800 baht. If you are in Bangkok for more than a week it’s worth buying a Rabbit! 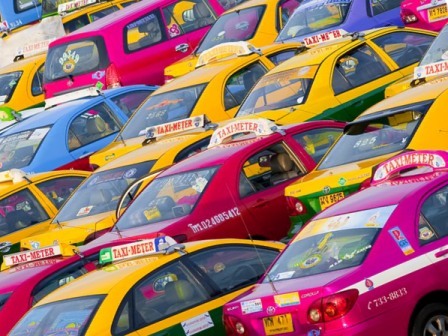 The taxis at Makkasan will try to ask for a fee, say, 100 baht for the trip as opposed to the taxi drivers on Sukhumvit who will have their meters switched on. The taxis at the airport may also try to ask for money and not switch on their meter, despite this practice being illegal. At the airport, go to the ground floor signposted ‘Public Taxi’ and ask at a little desk/stand just outside the gate. They will give you a ticket and ask for 50 baht fee then you wait for your cab which will usually be only a few minutes. The fare to lower Sukhmvit road is about 400 baht plus the tollbooth fee of about 50 baht. As far as BTS access goes, Sukhumvit Road runs from Nana (lower numbered sois on Sukhumvit) to Bearing (Higher numbered sois on Sukhumvit). Your hotel will probably be somewhere between these stations. If you are staying near the Chao Prya River or in the Silom area you can change from the Sukhumvit line to the Silom line at Siam station. Change platforms and head for Talat Phlu (formerly the last stop west on this line was Wongwian Yai (big circle), my favourite station name! In fact understanding the names of the stations is a good, fun way to learn Thai. Saphan Kwai-Buffalo Bridge (bridge is Saphan), Sanam Pao-shooting range, Chong Nonsi-Open channel, Saphan Taksin-Taksin Bridge, Sala Daeng-Red Gazebo, Talat Phlu-Phlu Market. If you EVER get into a cab and you don’t see the meter lit up and starting at 35 baht ask, ‘ Mai me meter?’ (You don’t have a meter?’) This is not rude or confrontational and if the driver is NOT trying to rip you off he will point the meter out or turn it on. If he IS trying to rip you off he will say ‘mai, 100baht/200baht/300baht or whatever he thinks he can get away with. A free/vacant taxi displays a red sign in the lower passenger sign window. These can be hailed by waving at them! A friend, despite having visited Thailand before took a cab from Sukhumvit soi 12 to Sukhumvit soi 22 ( about 1/2 mile, if that) and paid the cabbie 200 baht (no meter!) so anyone can get ripped off. Don’t encourage it; make sure the meter is running! 35 baht is the fare for the first kilometre of your journey and the standard charge even if you go a few hundred meters, after this every additional kilometre is much less; about 5 baht so a journey of 2 kilometres should cost about 40 baht. but be warned, the price goes up the longer it takes and so with Bangkok’s notorious traffic, a jam could prove expensive, and at rush hours; morning and late afternoon to early evening there is always a jam! My advice is to use the BTS when you can and taxis when you are coming home late at night. Sometimes a taxi driver, on hearing your destination request will refuse to take you. This happens to Thai people as well as farangs. (white foreigners) It’s annoying but don’t sweat it because nothing you say or do will change his mind. I have tried and failed and it’s not worth the hassle. Just wave down another cab. I remember an adage in times like that; ‘never argue with an idiot, no one will be able to tell you apart!’ So true when it comes to Thai transport providers. Which brings me perfectly to my bete noir; the ‘sersi som ling’ (orange coated monkeys). Motorcycle taxi drivers all wear a sleeveless jacket, usually orange, bearing a number and the name of the district/area they work. Some moto taxi stands on the street have a price list, in Thai. I have actually met many exceptions who charged the going rate and drove their bikes with a modicum of care and attention but sadly, a lot of them are as dangerous as hell. Perhaps it is because I feel held to ransom by them that I am critical! The longer you live here the more you have to rely on the ‘sersi som’, to get about. The traffic is just too bad for ordinary taxis and so short of walking the only alternative is a motorcycle taxi. Nowadays I have my own mororcycle so watch their antics from another perspective altogether. My advice; negotiate the price first. A journey of about one kilometre should be about 20 baht. Some places it can be cheaper but I guess 20 baht is about the norm for a km. Once you get used to it, this form of transport is fun if a little dangerous at times. 3. Tuk-Tuks are often practical. Thai people use them to go short distances, usually under a kilometre. Why? Remember that regular taxis charge a 35 baht minimum. Price with a tuk-tuk driver is always negotiable and there are certain places where they lurk. Thai markets often have tuk-tuk drivers waiting around and they can be a cheap option for a short journey when there are two, or more of you. They are comparatively safe — just watch your step when boarding and disembarking as they don’t stop at the pier for long and do not let the dirty water get into your eyes. To prevent splashes, the boats are equipped with little curtains that you can raise by pulling on a string, but they have to be lowered at every stop so people can clamber on board. It’s better to sit closer to the front of the boat further away from the engine which can be quite loud. Pay the fare (10-20 baht) to the fearless helmet-wearing ticket collectors who clamber around on the outside of the boat, ducking at bridges, as it barrels down the canal. Press the green ‘bell’ button if you want to get off at the next pier, else the boat might just skip it. The piers now even have (tiny) signs in English, with the exception of The Mall Bangkapi pier, and it’s not obvious that you’re at the mall from the canal boat! There was a time when I used the Khlong every day traveling from Chit Lom bridge to The Mall, Bangkapi and back for 17 baht one way. Expensive! The piers are not easy to find if you don’t know Bangkok but walk down Petchaburi road from Sukhumvit road at the junction adjacent to Sukhumvit soi 4 and you will come to a bridge acrosss the canal. Underneath is Nana pier and heading west will take you to Khao San Road if you are a pseudo hippy or Raemkhamhaeng if you are a student or teacher! The Khlong boats are worth a trip just to experience a truly unique form of transport. I was only scared of drowning once, in the rainy season! Enjoy! As far as trains and planes are concerned, internal travel is relatively cheap and easy and I suggest looking at the websites for Air Asia, Bangkok Air and seat61 for everything you need to know about rail travel anywhere in the world. Of course you can always post a comment/question if you need any help. lots of people buy packages to the islands or book flights for ongoing travel from Bangkok to Phuket for example. I recommend waiting until you get to Thailand before booking too much unless you use the links provided here. Flights, tours, buses and trains are plentiful, convenient and cheap.